Unions unite! Union Label Printingcomes in handy If you need to keep all of your publications and print materials union-friendly. As a member of the CWA, Park Press has the ability to display our union bug on any of the jobs that we print. This shows the people your organization is trying to reach that your assets are handled by union employees. We can create V.I.P. section on our site just for your business. With your custom storefront, you can quickly order stationery, marketing pieces or any other printed material that we have prepared for you in the past. If your business has more than one location, your Park Press portal is the perfect solution. Since each location has its own portal code, you can login to see the items specific to that location. Access to our eDocBuilder allows real time product design. 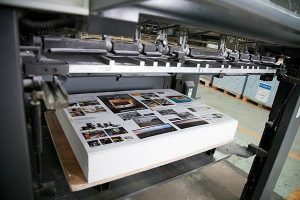 Newspaper Printing is a fantastic and economical way to get your message out to those within your region or all around the country. Tabloid and broadsheet papers can be customized with different sizing, paper, page counts, color pages and insert nesting. Combined with our in-house mail shop, having your papers delivered to your selected areas is easy, affordable and fast. Park Press has been providing union print services in Boston, Saugus and all over the North Shore for over 80 years. We provide a variety of services in house, including large format printing, union newspaper printing, copies, booklets, letterhead, sell sheets, newsletters, banners, copywriting, direct mail services and other union print services. Brian dropped off the folders and business cards today. All we can say is WOW! They exceeded our expectation. Donna and I are quite pleased with the results. Thank you very much for your suggestions, creativity, customer service, and most of all patience. We realize that we were making small changes near the end. That said, the results were worth it. Thank you for turning that around so quickly! We are so appreciative! Hope you both had a wonderful Thanksgiving. From the staff at the Nobleman; I’d like to start out by saying thank you for all your help with the printing of the newspaper. We are always so impressed with the quality, customer service, and overall experience with Park Press!